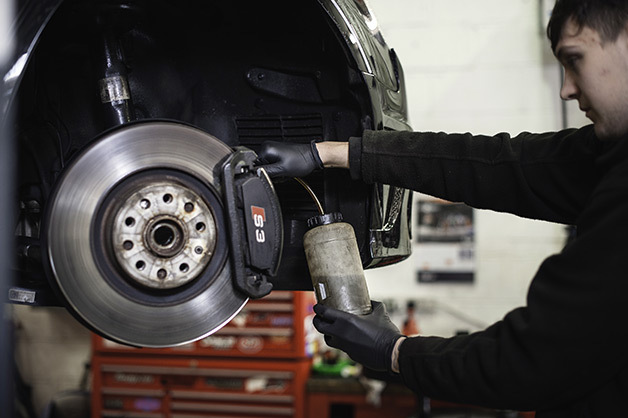 ​Give yourself a “brake!”: When and Why should you change your brake fluid? What is brake fluid and why is it important? Brake fluid is an incompressible fluid that converts the energy you apply to the brake pedal to the four calipers. DOT5 are not. They can contain water in the system however it is likely the system has a leak or water has entered the system from other means – It’s not normal to find DOT5 used in cars. The boiling point of the fluid is one of the most important characteristics. Your braking system relies on the fact that the fluid is incompressible. If the fluid boils it becomes a gas (which is compressible) and will lose most of its ability to transmit the forces applied by the brake pedal. At the point that the brake fluid has taken on too much water; the water content of the solution will be compressible. As the water content of the brake fluid solution increases; your boiling point will also become lower. When is it time for change? The first and possible most obvious place to check would be the service history of your car. If the history doesn’t show a fluid change or it was outside of the manufactures schedule it’s probably best to get it changed straight away. Inspect the colour of the fluid in the Master Cylinder. If it is Dark brown or close to black it is in a bad condition and will require changing. Get a professional to check it for you. If you are unsure of the condition of the fluid or have any doubts about the performance of your braking system get it checked straight away. A brake fluid change isn’t a service that will cost you a great deal but will have huge benefits to your braking system. Regular DOT4 fluids require changing at least every 2-years, whilst Performance Brake Fluids ideally need changing every year. Can You replace the fluid yourself? Although you can change the fluid yourself the braking system will have to be “bled” to remove any air that is in the system. There are several bleeding kits available, but we recommend you take it to a professional if you are at all unsure about the process. Here at VBT we have a fantastic selection of different Brake Fluids available from ATE, AP Project Mu and 710.